Scroll down for more fresh and canned tuna steak recipes. In medium bowl, combine chopped tomatillos, chopped tomatoes, chopped green onions, garlic, 1/2 cup olive oil, cilantro, and lime juice. Season with salt and pepper. Add chili peppers, if desired. Refrigerate the salsa until about 1 hour before serving and then bring to room temperature. 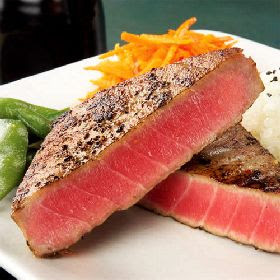 Brush tuna steaks with 2 tablespoons olive oil. Broil or grill tuna steaks about 4" from heat, turning once, about 4 minutes on each side, or until fish is cooked to desired doneness. The tuna steak recipe is ready to Serve with salsa.